Vilna Gaon State Jewish Museum welcomes summer with a new exhibition ‘Lithuania in Litvak Arts’ which is to open on 6 June 2018. The exhibition will present more than forty pieces of art from the holdings of the Vilna Gaon State Jewish Museum, Lithuanian Art Museum, Mikalojus Konstantinas Čiurlionis National Art Museum, José Gurvich Museum in Uruguay and private collections. Most of the artwork will be publicly displayed for the first time ever. Information stands and two video films will help reveal the theme of the exhibition to an even better extent. According to the curator of the exhibition art researcher Dr Vilma Gradinskaitė, the exposition is unique in that for the first time ever in Lithuania and in the world it presents images of Lithuania in Litvak art and allows perceiving Lithuania through the eyes of Litvaks. 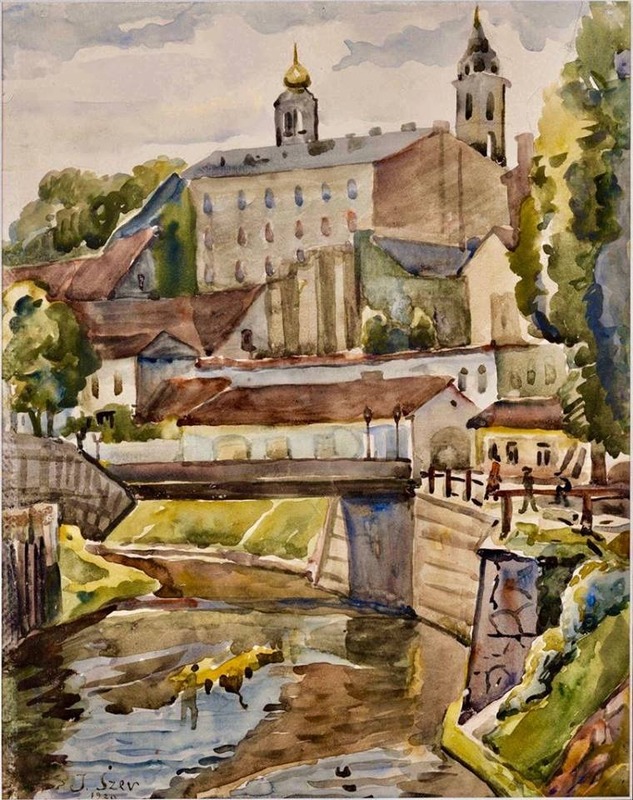 ‘The exhibition highlights the most important aspects of Litvak arts which allow revealing the typing of images of Lithuania and their transformations starting with the romanticised historic Vilnius, native shtetls and traditional Lithuanian landscape, and going on to poor quarters of the working class, city ruins and ghettos of Lithuania fenced with barbed wire. Visitors will admire the early paintings of such world famous painters as Arbit Blatas, Max Band and Issai Kulviansky that are rarely exhibited, very few in numbers and represent the early Lithuanian period in the creative life of the artists, and will be offered an opportunity to enjoy the feeling of getting immersed in the artistic childhood memories of Samuel Bak, Théo Tobiasse, Jose Gurvich and other Litvak painters,’ says the art researcher. The exhibits will be accompanied by 15 stands with information in Lithuanian and 15 stands with information in English. Poetry lovers will enjoy poems translated from Yiddish, whereas history, music, cinema and theatre fans will find a lot of information that will be of interest for them. The exhibition stands have been prepared by using material from the holdings of the Vilna Gaon State Jewish Museum, including visual and documentary material from other museums and archives of Lithuania, Poland, Germany, Israel, Italy, Russia, USA, Uruguay, and private collections. Visitors will have an opportunity to watch two unique movies that have been undeservingly forgotten. One of them is the silent movie from 1924 produced by Polish Film Studio and titled ‘The Legend of Vilnius’, which was dubbed in 1933. Josef Bulov from Vilnius, who at that time was a successful actor in New York, performed the role of the narrator. The other movie is from 1964. It was made by Lithuanian Film Studio and directed by Raimundas Vabalas, who created it in the form of the first Lithuanian colour movie-pamphlet titled ‘March, march, tra-ta-ta!’ (with Grigory Kanovich and Ilja Rud-Gercovskis as co-authors of the screenplay). However, the audience of the time did not understand or admired the political satire presented in the movie. There will be audio guides for the visually impaired visitors of the exhibition ‘Lithuania in Litvak Arts’. Young visitors will have a special opportunity to play with magnetic jigsaw puzzles and build Lithuanian landscapes and pictures of small Lithuanian towns – shtetls. This exhibition will serve as an introduction to the Museum of Litvak Culture and Identity which is already underway. The future museum will operate as a subsidiary of the Vilna Gaon State Jewish Museum and will be located in the historic building of the Hebrew gymnasium Tarbut. The Museum of Litvak Culture and Identity will host artistic and cultural heritage of Lithuanian Jews that is currently scattered all over the world and will highlight the connections of world-famous expatriate artists and inventors from Lithuania with their Lithuanian Jewish origin, traditions and cultural environment of Lithuania, and present a number of distinctive cultural phenomena. The plan is to open the museum by 2020.